We accelerate growth and digital transformation across the agriculture & food value chain. Building the future of digital health together. Building the future of a digital energy infrastructure together. Utilising IoT, industry 4.0 and digital twins to deliver profits and efficiency. Hospital ward management Digital Twin. The digital Revolution in Cancer Is A fully functional Digital twin a reality in Oncology? Siemens has been and always will be a healthcare innovator with regards to technology. Ever since they Released the first industrially manufactured X-ray machine in 1896, they have pioneered the latest medical developments ever since. At the Mater Private Hospital in Dublin, one of the leading private hospitals in Ireland, they plan to make patient care the best in Ireland. By Teaming up with Siemens engineers, their radiology department was redesigned in both layout and infrastructure. Using RIS data and the hospital’s architects, they designed a fully digitized image of the department and the Siemens design team, looked at the layout of the ward and implemented various improvements. Challenge Advisory is delighted to announce the launch of our digital twin healthcare workshop taking place in London, November 2019. This workshop is designed to support the growth and adoption of digital twin technology in healthcare, Pharmaceuticals and hospital management. Created for the industry, Challenge Advisory is presently working with 30 members of their steering committee to build a framework and agenda to build upon the work they have already done, to develop the value of Digital Twins. Learn more about our digital twins healthcare workshop here. By using the workflow simulation digital twin, wait times for CT and MRI scans were reduced by an average of 19 minutes, faster patient turnaround times, a 32% increase in capacity in MRI scans and 26% in CT scans. It also showed that it helped lower staffing costs, with an average of 50 minutes less of overtime required per day, which equates to 9,500 euros in savings over a year. This clearly shows that the future is in digital twins, to not only help optimize results but also to further develop ward management protocol and also provide cost reductions. Siemens has once again shown why they are leading pioneers within the healthcare industry and are showing once again why they will most likely lead the way in the digital age of developing digital twins further and changing the face of healthcare. Digital twin workflow simulation is a powerful solution for intelligent decision-making. It is done via building a 3D computer model of any given clinical environment such as an operating room or accident and emergency. The system will then turn the 3D model into a digital twin of your institution via data that was input to display everyday ward work. How? By inputting your operational and financial data to simulate your actual everyday workflows. This virtual replica enables the testing of a number of scenarios and layouts. Which enables the user to determine both work and financial output. By displaying realistic animations and delivering quantitative reports. Fully functional digital twins can now be created a that enables trial and error or ward management and can run scenarios in a matter of days, whereas previously this would have taken months. We will not be diving deep into how the virtual twin workflow simulation model works since we will be covering this topic during our local digital twin seminar held here in the UK. By analyzing operational data to visualize and simulate MRI and CT usage through workflow through a week-long period which included workshops, stakeholder interviews, and process observation. Based on the analysis outcomes, the team created a 3D computer model of the radiology department and its operations. The result was a digital twin that enabled them to test different new operational scenarios and layout within the radiology ward. Operational scenarios enabled care to be changed and given accordingly. Through the application of this newer technology, we can help advance businesses and organizations globally to ensure maximum output of services according to individual requirements. Through full comprehensive Analysis of the digital twin development and any challenges, we can implement all practices required for adopting the digital twin. A Digital twin is referred to as a digital replica of physical assets (physical twin), processes, people, places, systems and devices that can be used for various purposes to run simulations without the disruption of equipment or harm to individuals. Within healthcare, a “digital twin” would ideally be a real-life replica of a human body which shows all physiological, pathological outcomes in the present and future, all mapped out in a highly detailed visual. The reality, however, is this process is currently premature and consist of a complex network of statistics, genetic pathways and possible outcomes amongst many others, in which only trained professionals would be able to interpret. 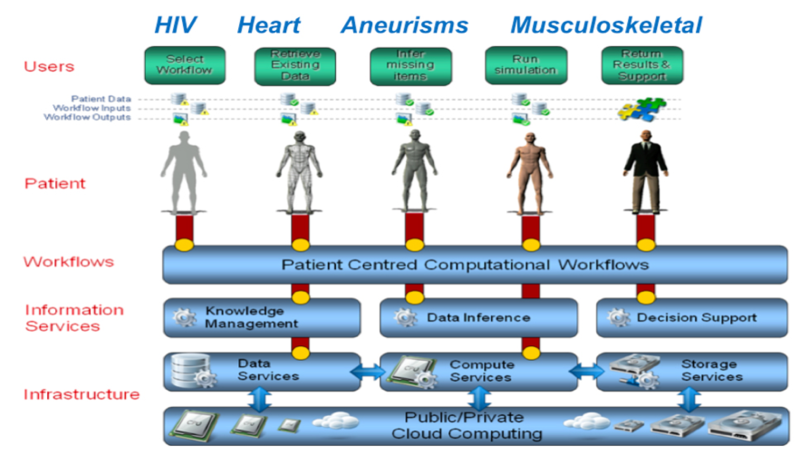 The “Digital Twin” concept would be applied to enable personalized medical treatments in areas currently needing much more research such as Oncology but to also enable collaborative data to be researched and determine successful treatment, and pathological diagnostic problems and help aid with diagnostic by running treatment simulations without harming the patients. Is a realistic digital twin within oncology achievable? The ultimate goal is to encompass numerous current AI concepts to work in synchronization to enable the development of a fully functioning digital twin. In an ideal world If data and technology were shared amongst leading players in Artificial intelligence to create a realistic model then, in theory, this would be highly achievable within the next 5 years. The reality, however, is that currently, it is very futuristic. There is however two initiative currently in development, one in Europe, the digital twins initiative and one In China, the 12sigma project. Firstly the Digital twins initiative, which is a collective of over 200 partners from 29 different countries, which has the potential to receive 10 billion euros in funding over a period of ten years. With the aim to develop a revolutionary approach to healthcare based on detailed modeling systems, which would enable various treatment simulations to be run without any harm to the patient. They are planning on running the first pilot schemes soon, including one in the Internet of things (IOT) which will hopefully enable the project to be taken to the next level. One of the main aims in relation to oncology is to change and energise biomedical research and clinical practice via developing novel modelling, diagnostic and therapeutic technologies to not only increase patient well being but also save the ever expanding healthcare budgets throughout europe. They are also addressing one of the main dilemmas of production a data driven digital twin via resourcing a lot of their research into data protection and how the project can ensure all patient data is is governed to ensure full protection. The 12Sigma company are one of the first companies to combine Artificial intelligence and deep learning to produce medical image diagnostics and in depth medical data analysis. Deep learning software, simply put, tries to mimic the activity within human neurons via usage of algorithms inspired by the human brain to enable it to learn by experience and develop skills without human interference. 12Sigma uses deep learning networks to seek out numerous diseases whilst simultaneously providing insights into other areas such as early and rare disease detection and treatment planning and patient monitoring. 12sigmas deep learning product enables doctors to interpret challenging medical cases. In regards to cancer is is believed to be able to detect tiny lesions as small as 0.01% of an image and achieve a 98.5% accuracy rating. This product is the first of its kind on the market. It is not only there deep learning platform that is revolutionary, their medical data analysis platforms perform outstandingly in precision medicine, genome sequencing and pathological analysis, which help aid in disease diagnostics, especially in cancer. They also provide a cloud platform in which doctors can interact and help them provide accurate and precise diagnosis, regardless of where the patient is located. Developmental updates have been slow from them, presumably due to privacy in an ever expanding market. Regardless, the work they have done so far is groundbreaking and could only open more doors towards the development of a fully functioning digital twin. Professor Yu Feng, of The School of chemical engineering Oklahoma state University, has computerised an in-silico hypothetical digital twin. Not using data derived from a live human, but a virtual human system. Using computational fluid-particle dynamics (CFPD) simulations to determine if the target area can be decreased and an increase in concentrated drug dose via inhalation can be achieved. Using multi-modeling framework Dr. Yeng hypothesised, that the use of a fully digitised twin to increase the drug delivery on the target area via aerosol inhalation of chemotherapeutic agents increased from 20% to nearly 90% via visual determination of where to target could potentially improve the prognosis for thousands of cancer patients across the globe. (image courtesy of fung et al, 2018). There are however some modeling systems in place that if you used in conjunction to one another, increases the likelihood of making a digital twin achievable. A first point of call could be the Virtual Physiological Human (VPH), which is currently under production at the Virtual Physiological Human Institute for Integrative Biomedical Research, in Belgium. They describe the VPH as “A world-wide community that aims to create validated in-silico models of human health and disease via the use of individualized physiology based computer simulations in all aspects of the prevention, diagnosis, prognostic assessment, and treatment of a disease and development of a biomedical product”. VPH has 3 main targets; (1) the digital patient (VPH for doctors); (2) in silico clinical trials (VPH for the biomedical and pharma industry; and (3) personal health forecasting (VPH for the patient/citizen). All 3 targets can be correlated back to Oncology to enable efficient visualisation of the patient and determine specific outcomes, not only of pharmacological outcome but if patients are not responding to conventional treatments, then you could hypothetically simulate the outcome of a treatment via a clinical trial before putting them at any risk, which aids the argument towards the ethical implications of Digital twins. If VPH was paired with a huge database such as IBM’s Watson, which is an integrated database programme, in which it extracts key attributes from an individual patient’s medical record, via language processing to understand all patient data when integrated with the electronic medical records. It can then provide evidence based treatment recommendations via combining information with training from the memorial sloan kettering cancer centre (MSK) to provide ranked treatment options with supporting evidence from over 300 medical journals, over 250 textbooks and 15 million pages of text to enable the treating Physician to provide expert, up to date care. Another recently published modelling system used in cancer progression, which could be hypothetically paired with a system such as VPH is the REVOLVER model, from the Institute of Cancer Research. It does not possess its own interface, and the script is run on the open access R statistical Software system. It works via multiple patient evolutionary models aiming to increasing their tumour structural correlation to highlight hidden evolutionary patterns. Its validity is increased due to it being able to run both binary and CCF values within tree phylogeny to detect tumour evolution. Although still premature it is a very thorough indicator of tumour progression. If either model could be incorporated into a virtual Human then it is plausible that they could work in conjunction to help determine medical outcomes without any harm to the patient. Implementation of a database and a virtual twin could be the initial building blocks for the desired result of a fully fledged digital twin, there are however many issues in which a project like that should need to overcome. Firstly within oncology, there are numerous signalling pathways and cellular mechanisms, most of which are not still fully understood, if at all, which would make disease progression and outcome hard to validate, secondly you have to have as much data as possible in regards to the microbiome, pharmacogenetics and an extensive tissue bank database to be able to determine all outcomes. Which asks the question, are there too many human factors involved to create a complete one? Would modelling certain aspects be more efficient? For example, if you model the cardiovascular system of a patient and locate the tumour, could you then run successful simulations of drug trials and look at disease progression? Currently, digital twins of specific systems make more sense as there is already the foundations there to enable this. But with 200,000 cases of adverse drug reactions in the last year alone throughout europe, half of which are attributed to cancer, and resistance of chemotherapeutic drugs more apparent. The world of medicine needs a different alternative without causing harm to patients whilst also providing a platform for better healthcare from physicians. The speed of which digital science within healthcare is quickly progressing gives the presumption that an answer is not far away and what is ever more promising is that it is showing no signs of slowing down. Looking at digital twins in healthcare. Within the NHS, the digital healthcare is still far behind its private counterparts in the UK and all other public sectors throughout Europe..
Our next workshop is in London in November looking at the adoption of digital twins across the sector. See how we can support you, contact the healthcare team. We help Industry, Governments and Startups with their most challenging issues and opportunities. We partner with our clients to drive growth.